We build one frame at a time from start to finish. When we begin building a frame, We’re building a frame for you, not some production model with a couple of tweaks. When we start your build, the first thing we do is get your customer file and review your design carefully, the entire order form, and a log we keep of all our conversations. Then, we pull your box of material that’s waiting on the shelf. Once we review your tubes and parts, we’re ready to begin. All of our machinery, jigs, and fixtures adjust to work with virtually any size and shape of tubing. 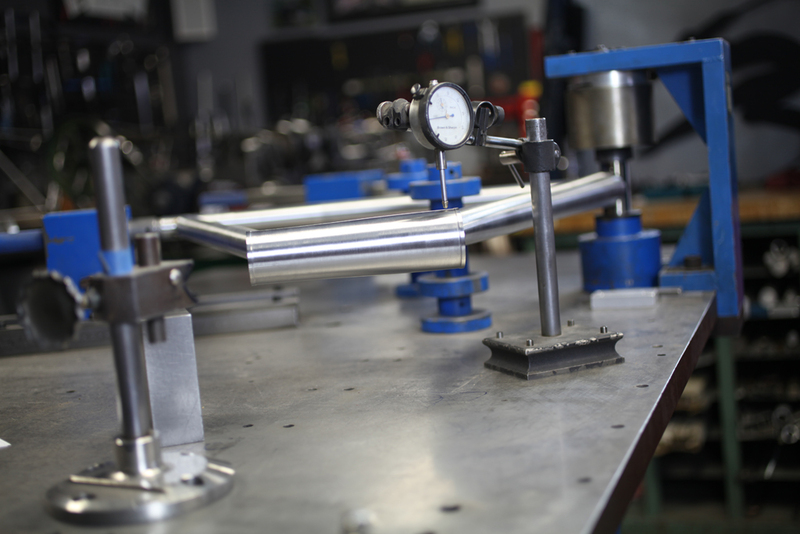 We adjust the tooling and jigs specifically for your bike. Once the fixtures are set for your frame, they will not be changed until the frame is complete. We machine miter all tubes on milling machines. We check all specifications repeatedly to make sure the miters are flawless. After all the tubes have been cut to the specifications of your design, we load your tubes in our Anvil Super Master tacking fixture. There is a fail-safe in this process that ensures the tubes are cut accurately. After loading the jig and fine-tuning the fit and clearances, we tack and align the frame. Once the frame has been tacked and aligned, it is ready for welding. No matter how accurate the miters are and how straight and rigid the frame jig is, heat from TIG welding or brazing causes frames to deform. In the past, it was possible to correct frame deformation after welding in a single step using nothing more than a long, steel lever bar. The thin walls and short butts of modern ultra-light tubing make single-step alignment impossible. Because of this, we have developed a weld sequencing and aligning process. We begin by misaligning the frame a predetermined amount. Frames are then welded one step at a time in a special sequence. In between each step, alignment is checked to verify that the frame is behaving as expected. Any necessary corrections are easily made at this point. As the frame nears completion, the heat deformation from welding combined with our systematic misalignment brings the frame closer and closer to alignment. Once fully welded, Strong Frames are straight and free of residual stresses that single-step alignment can cause. After the frame has been welded and aligned, we silver braze (for steel) or weld (for titanium) all of the small parts. After that, finish work is done and the first of two frame preps is done. Before the frame is painted or media blasted, the Headtube is reamed and faced, the Bottom Bracket is chased and faced, the Seatube is slotted, reamed, and honed, and all other machine surfaces and threads are cleaned and checked. This will all be done again after the frame is finished to ensure that it “falls” together when it’s completed.